The materials for HEAVY-DUTY sine plates are carefully selected to withstand the thrust and chatter of machining cuts, during a long life of accurate service. 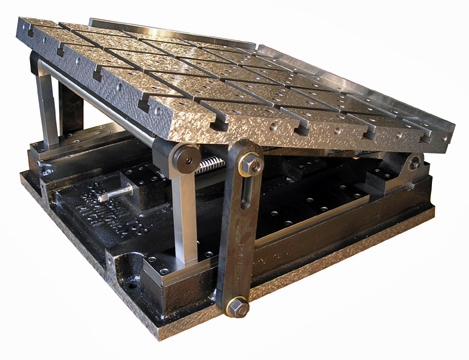 The top and bottom plates are made from heavy-sectioned class 35-40 cast iron for extra strength. 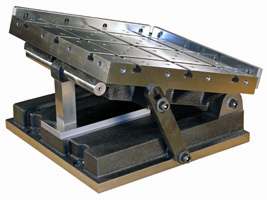 Top plates of all models are T-slotted for convenient clamping of work pieces. T-slots are held parallel with the sides of the top plate within 0.0005" per 12". Models B-24 and B-34 are supplied with a built-in ball screw elevating mechanism for safe and easy opening and closing. All models, except the B-12, have a hand-flaked top surface. The B-12 is ground. All models include extra-heavy locking straps.